Fayetteville, Farmington, Springdale, AR Chiropractor & Physical Therapy : Wellness Professionals, Inc. 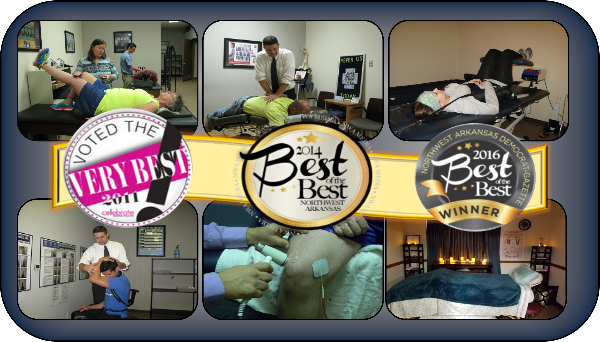 Thanks to our patients, we are consistently voted the best in Chiropractic care and Physical Therapy in Northwest Arkansas! You need the best care possible when dealing with Chiropractic issues. Give us a call today at (479) 444-9449 and get back on the road to health! Can you imagine living with fewer headaches, less back pain, and increased mobility and vitality? Here at Wellness Professionals, our goal is to provide quality treatment, leading the way with comprehensive care. We believe in treating the body as a whole, relieving not only symptoms but fixing the root cause of the problem. Wellness Professionals provides quality chiropractic care, physical therapy, massage therapy, speech therapy & Pilates to patients in Northwest Arkansas, including Fayetteville, Springdale, Farmington, Johnson, and the surrounding areas. Using a multi-tiered approach to patient care, we dig deep to find the true cause of your pain to provide lasting relief. We offer quick, effective treatment plans with the goal of helping patients to enjoy even the simplest things in life. Utilizing chiropractic treatment, physical therapy, decompression, therapeutic massage and modalities such as traction, ultrasound therapy and electrical stimulation, patients can expect to achieve a balanced and healthy body. We are committed to providing each and every patient with attentive and personalized care, understanding that goals and circumstances vary. Treatment plans are never one size fits all; they are customizable and adaptable to your always changing needs and goals. Every time you walk out of our office, we want you to feel better than when you walked in. Don’t let your pain hold you back from your true potential. If you suffer from back pain, neck pain, headaches, TMJ, sciatica, extremity pain, or have been in an auto accident, Wellness Professionals can get you back on the road to health. Schedule a free, no obligation consultation today with Dr. Michael Dickerson by calling our office at 479-444-9449. Are You in Pain? Need Help NOW? Physical therapy is designed to maximize one’s quality of life through the rehabilitation of physical impairments or injuries.